The Yarn Shop which resides in Heaven…….. I saw those signs, I just couldn’t get OUT of LesHalles……there was a Piscine (better than the JCCA, I kid you not) and there were cinemas, and every kind of shop and restaurant imaginable But, I finally found the right sortie, and exited. And once again, I couldnt’ take my eyes off all the GEORGEOUS COLOR everywhere. I asked some people if they were “in line – in Queue” and they said in broken English that they were…….and that they had to wait there to be WAITED ON…….I was confused and said, “Oh, Okay, well, I know what I want, so I’ll go here”……..NON! They said – “we are in line and you go behind us.” “OH. I see.” I pouted. So I did – and I waited and I waited and I waited…….to be “waited ON”…….Finally, the lovely tall salesclerk came to me and said “Yes?” And I explained that this was my FIRST knitting course and I simple wanted the cheapest yarn that I could find and the cheapest needles possible and then I’m out of here. Okay, well, I didn’t exactly say those words, but I did say the word “ACRYLIC” and you would have thought that I just asked for Walmart jeans in a Versace boutique! Okay, then, I’ll take wool, I say, knowing full well that I am going to ITCH myself to DEATH if I wear it anywhere near my face. 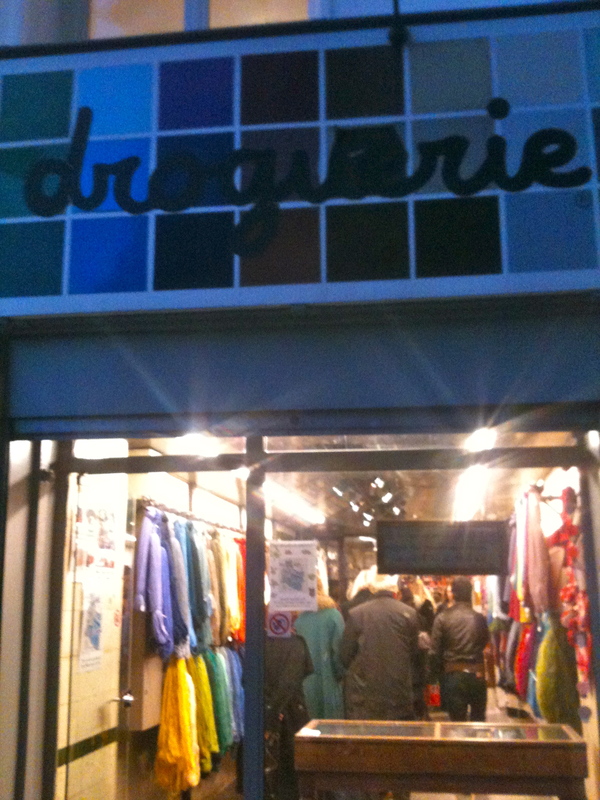 But this is Paris, and this is La Droguerie and I must do what any self respecting KNITTER or “knitter to be” would do. GO WITH WHAT THEY TELL YOU. About 10 minutes later, my beautiful salmon pink with specs of mauve colored yarn is brought up to me, (they go in the basement and wind your color in a lovely shape, so lovely, infact, that you don’t even need to MAKE anything out of it you’re thinking) that I exclaimed, ‘oh wow, for me?? It’s so PRETTY!! ” and she ‘s looking at me like – this lady is really very strange……..and I pay for it and the beautiful wooden needles that were also a fortune. I say my few nice french words to thank them and have a good evening and I’m on my way out the door passing up about 10 people who have just come in line behind me. (They are “Dyed in the Wool TRUE KNITTERS!! !” – I just had to say that!!) 🙂 This is an amazing, very colorful, very tactile-ish experience that I would NOT have passed up for anything. It also means that because I have paid a tiny fortune for simple wool yarn that is spun somewhere in France, and where they paid no high shipping rates for it to come from far away – whereever – New Zealand or Scotland – who knows – that my question is: why in the world is it so pricey?? I’ll never know, but It was worth the trip to this colorful threaded, yarn, baubles, buttons, ribbons and bead shop and I’m sure it’s not in vain??? And that this scarf will be one that I will never ever ever forget making. ? I’ve already taken the stitches out atleast 5 times now. Once in the knitting class at the church, and 4 more from the train to David to I don’t remember where else. Oh! And while waiting for David to finish teaching, I was still knitting and doing what Antionette (from Church) said to do with my beginning stitches when, out of the blue, I got to a place that I was simply stuck. I tried, this way, and that way, and nothing was working with the stitch that I had just done a hundred times. So, I looked to the left and to the right and then straight ahead and made eye contact with this really nice attractive lady. I said, “Do you speak English”? And she said – “Non! “ and then I said – and pointed to my skein of yarn – do you know how to do this? I have forgotten something and can’t continue on……..” She gets up and says, in French, – something something something and raises her intonation at the end, so she is ASKING me a QUESTION, to which I have not the SLIGHTEST idea what she is ASKING!!! So I say, “I don’t know -J’ai ne comprand pas – this is the way the INSTRUCTOR said for me to do this” and this lady is now evoking everyone in that little waiting room to help her out here with French vs. English, and one girl comes to help and it’s not helping…….and this nice lady is just NOT understanding why I am doing these stiches on TWO needles and I say, “Because the TEACHER said to do it this way! !” and the lady is shaking her head, saying something something something and before I know it, she’s REMOVED the beautiful work that I’ve just been doing for the last 2 hours and whips it off the needles!!! I ‘m like ‘W H A T???? ?” and then I realized – she had a “better way” – it’s called the FRENCH WAY, actually, because she probably secretly knew that my TEACHER was AMERICAN and that it was NO GOOD to be doing my stitches this “wierd way” _ (I never heard that actually) but when you listen carefully to this language that you do not understand, the word WIERD, does come out, I swear it does…..) So, I had to laugh kind of – inside, that she just dropped all my stitches; No, not DROPPED, – REMOVED everything I had done, and was now proceeding to have me totally start over and do it HER way, or not at all. So next week, when I go to pick up David, and I show her my progression of my knitting project I better be sure that I am doing it HER way, because I can explain all this stuff to my AMERICAN teacher and she’ll be sure to understand, but the FRENCH one???? NOT- A – CHANCE!!!!!!!! That’s my story, and I’m knitting into oblivian……….